So much fun painting this series of soggy doggies. This is a series that I have had planned for a number of years. Have taken so many reference photos in preparation and have now finally decided to start them. Happy dogs make me happy! You learn so much when you start to paint in a series. I wanted to strike a balance between a looser and less detailed background, while painting the subject with a higher degree of realism - all this while attempting to capture movement. No small task. Oh yes - in a small format and in oils. So far the paintings are 8” x 10”. I think the next round will start to get a bit larger 9 x 12” or 11x14”. Oh Helen, must you do try to challenge yourself all the time? Apparently! And apparently I like it. I decided to paint a few relatively small paintings in between the secret commissions so I would have some fun things to share. The commissions will be shared after the holidays of course. Now that I have completed these requests I am able to get back to the large white lilac. Hoping to have it completed prior to the holidays! So I got myself into a bit of trouble with this one. Knowing that oil and water don’t mix - right? And the hazards of painting when slightly exhausted. I thought I would get started painting this little 8 x 10” oil. It presented a rather nice diversion from the large white lilac waiting over my shoulder. I organized may paint. Squeezed out the right amount of luscious oil paint. Then proceeded to paint. With this type of painting I generally start with the background first. That way the fur that is blowing in the wind is on top of the background paint rather than blocked in around it. This helps to make the painting look alive and suggest movement. One of the benefits of painting tired is that I was not too caught up in the details of the fur and water but rather the movement of the water. This allowed for looser, flowy handling of the paint. Soon it was time to add in some more colour. Bailey’s collar. Bailey’s tongue. And the white-ish patch on his chest. I squeezed out some more paint but found that the paint was drying far too quickly. I muttered about the mini-split heater above my head speeding up the drying time. The paint was even getting funky on my palette. I continued to paint on, muttering about it as I went. When all of a sudden it occurred to me that the second series of paint I squeezed came from a different location! Drat! For the second round I grabbed my acrylics not my oils. And I even keep my oils and acrylics on different areas of the studio so this would not happen! Face palm! Was this a disaster? Did I already say drat? Separating my supplies seems so logical to me. My foolproof plan translated to proof of a …..
Ah, the holidays. They have taken their toll on my productivity. But, in fairness I always know I may not get as much done as I hoped. Often I have more ambition than time. And family and friend come first. Tender Blues is a large painting. With a whole lot of little florets that seem to be taking more time than usual. This is my impatience showing I fear. My acrylic paints are acting funny and not in a charming way. A couple of things are going on. First, my heat source. The mini split operates with a fan to distribute the heated air. The heated air dries the paint out so fast on my pallett. No amount of spritzing it will water seems to help. It is drying out way to fast. Second, well they paint is going funky in the tubes. It seems to be thickening up and gloppy - like toothpaste. I do not know what is making it do this - but I really do not like it. The texture of the paint will not apply smooth and there is certainly no blending ability. What the heck? Anyone else experiencing this problem? And it is not limited to any brand in particular, Hmm, I think it is time to get serious with oils. My daughter Katie was supposed to fly home on Friday -you know the day after the storm. YOu can imagine what happened. Flights delayed everywhere and some cancelled creating a backlog of weary travellers. From mechanical failures and get this, the plane would not start this morning from the cold! Delays. Cancellations. On the up side, we got to spend more time with her. Maybe tomorrow she will be able to fly out. I have also been working on a few commissions. I am able to share this one with you now. Meet "Murphy" a portrait of a very expressive labradoodle. So much fun to paint this guy. HIs owners were surprised by this thoughtful gift and very happy with it! Gotta love that! And I will be delivering another one tonight. Gotta love that as well. Still broken. My husband managed to get it back together enough that I can use it. The crank awkwardly still cranks. (he missed putting one of the ball bearings back in but we will not tell) But it is stable enough that I can use it. Unable to easily raise and lower it. But it is usable while I wait for my shiny new, incredible easel motors towards me. EEEEEEEEEE so excited. We are vacationing in Bermuda with family for a few very special reasons. Announcing a new grand daughter expected in December and an engagement. Life is good! We were able to spend several hours each day just floating in the pool. When was the last time you were able to do that? Sigh..... Actually here it is a necessity to get relief from the heat and humidity. But that sounds like complaining and I certainly do not want to do that. ever so grateful for this experience. Between the heat, humidity and gentle rain I did manage to get some paintings done. Interesting though, the paint dried out immediately and the paper stayed moist. Who doesn't love a challenge...eh? A bit of a challenge with the internethere, this will be a short post. I delivered this commission this week. It was a birthday surprise and went over very well. 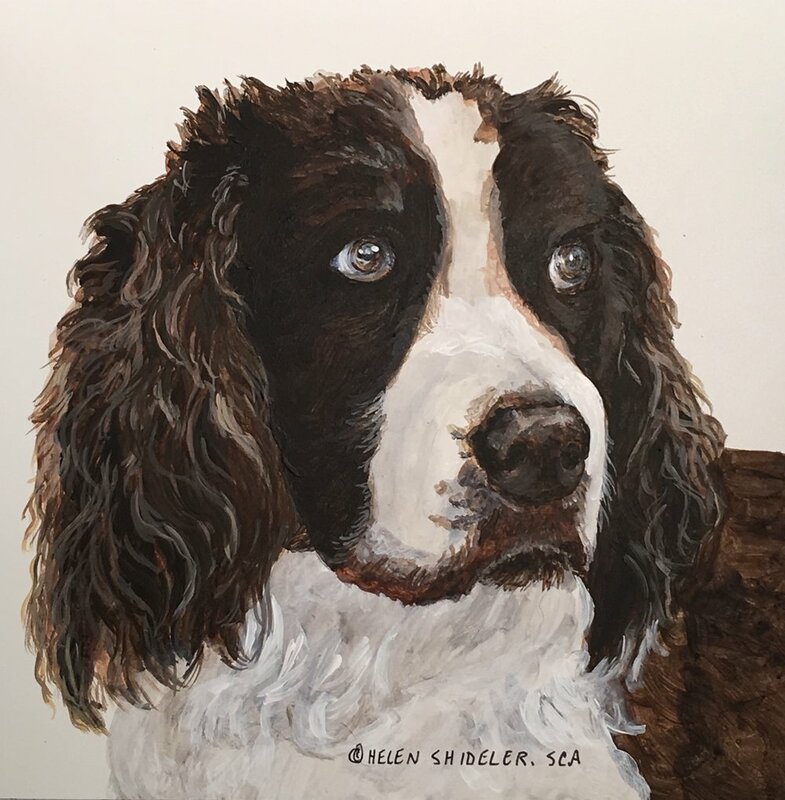 Now that Christmas gifting is behind us, I am able to post "Irish Anticipating"
Irish is my daughter and her husband's much loved doggie. She has been hinting at me painting him for awhile now. So I thought I would surprise her. Not an easy task as she has eagle eyes! I had to be really careful not to leave the painting or the photos lying around. This was not easy for me to do as I had to grab time when she was not here - and I tend to leave my current work out for easy access and review. Katie is super observant and would notice the tiniest hint of all things Irish. Irish was adopted from a shelter that uses monthly themes as a naming convention. Irish was picked up in March hence his name. And he looks really good in green, just saying. I think it went over well - don't you? This year was for the birds. In a matter of speaking. Although if you asked me the week prior to the challenge what it would was going to look like I probably would not have suggested I would paint birds and in acrylics exclusively. Wow, I find it so difficult to believe this challenge came and went so quickly. Although I felt each and every day of January because of the commitment. And I want to thank everyone for your continued support. I have to admit, people asking me daily what will you be posting tonight kept just enough heat on to keep me going! We are into February already and larger projects are starting to take up my focus. I have sooo much work to do. I get so excited with the possibilities. Only I may have way too much inspiration. If that is even possible? When I committed to the challenge I knew I wanted to paint some birds. I did a lot of photography in our yard between Christmas and New Years. The cardinals were so elusive. At first I was only able to catch a shot off in the distance. As time went on I figured out where I could hunker down and not scare them away as I attempted to photograph them. I was so happy with the results. Wishing you my friends, a bright and colourful February! I particularly love this challenge when it happens in January. It is such a perfect time of year to hunker down in the studio and paint till my hearts content. I take this opportunity to paint material that I have been thinking about for awhile, to explore new subjects, materials and techniques. 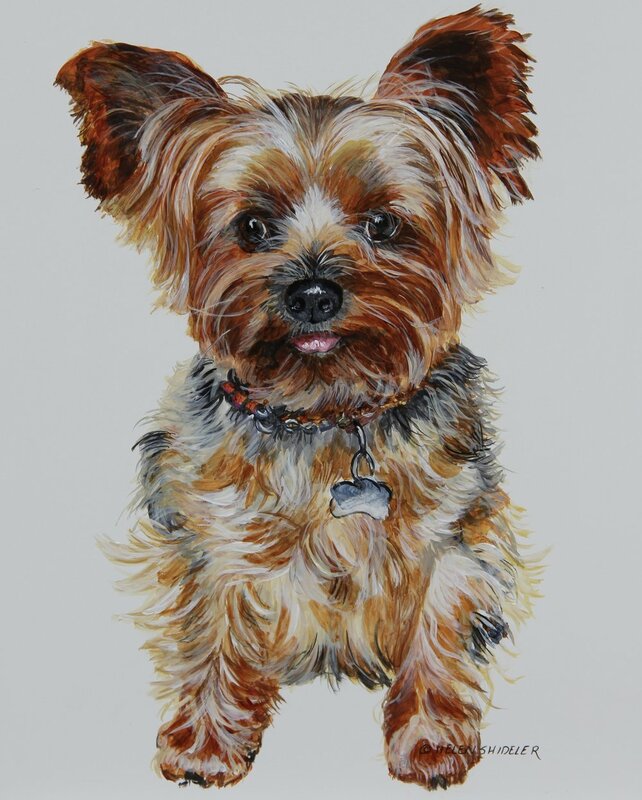 I have a vision of painting many doggies on large scale canvases. 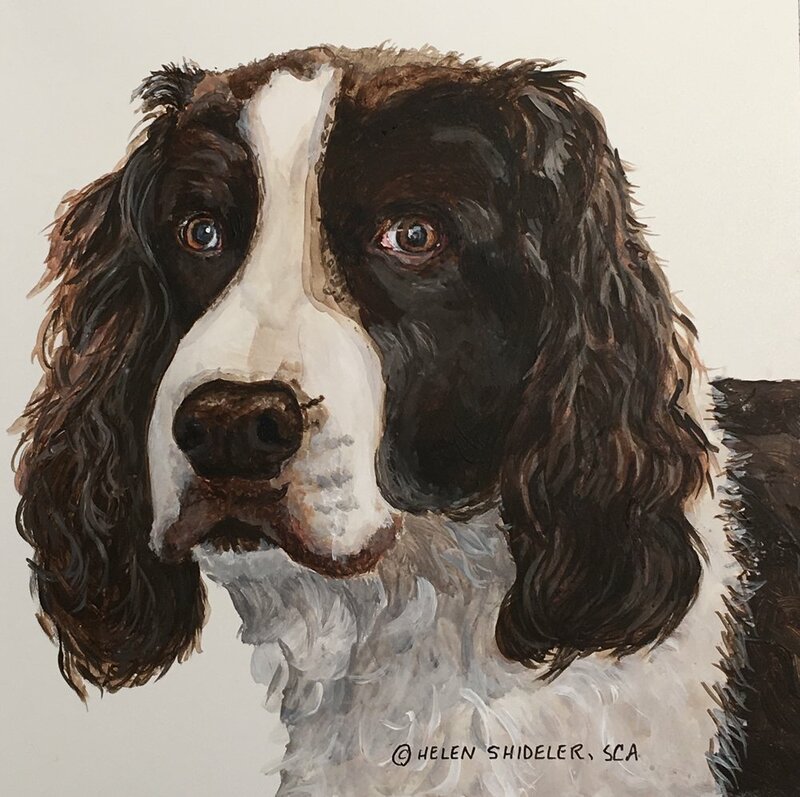 It is something I will get around to do one day – but in the meantime, painting dogs small scale during this challenge is great practice and fun. I smile all the way through. Between Christmas and New Year’s I was on a photo mission. I braved the elements for many days patiently waiting for the right photo ops to present. I knew I was on a chickadee hunt as the cardinals have proven to be too elusive and skittish. I guess being bright red they have to be very self-aware at all times. These sweet little black capped chickadees are spending a lot of time in the brushed getting ready for their turn at our feeders. We get so much enjoyment out of their antics. They always seem to know we are there watching them - or are they watching us? This little sweetie had just landed at the feeder and was all fluffed up. See, one foot has not yet fully landed on the perch. I tried to catch it in motion coming in - but that was a complete blur. They are freakishly fast. Anyway - He looks like he is so happy he is about to break into song! The chickadees wait for their turn at the feeder in the burning bush beside the house and in the grape vines that grow over the pergola. They have may place to perch and I think pose for me. This little fella I think had an altercation with something. His poor tail is all ruffled and ragged. Ok, I think this little fella was posing for me. At this point I discovered that I can take photos through the window with my long lens. Oh happy day. No more froze nose and toes for me! Obviously I have spent a lot of time bird watching...stalking. This little guy was working so hard to crack the sunflower seed that he dropped it. Good thing the feeder was full! There is a definite pecking orer at our feeders. First the red squirrels or furry birds as we call them. Then the mourning dove and the grackle (why has it not migrated). And then the chickadees. I often refer to them as patient – but they are certainly not. And I can honestly say - this is the last chickadee for awhile! Week one is behind me now and it is time to start another series. Gee, whatever will it be?